I’m enough of a fan of both New York and pizza that last fall I even did a Pizza Tour of Manhattan and the Bronx from Scott’s Pizza Tours. While I definitely have my favorite pizza places in this world (Bianco, Lombardi’s, Patsy’s, and the New Haven places), there’s plenty of room for variety in the pizza world. Indeed, the folks over at Slice compiled this handy guide to 21 different regional pizza styles that are out there in this modern world of mine. However, if you really add up all the styles, look at all the chains, and really look at what people think and expect with the word “pizza”, the result is something similar to your basic New York style “Slice” of pizza. A thin but still chewy crust with moderate saucing and fairly heavy cheese (and not too many toppings), this is your standard “fold it down the middle and eat while standing” pizza, usually bought from a place advertising low cost slices ($0.99 used to be common, although recent inflation has hefted a lot of those prices to $1.25 and $1.50 these days). I always have called this style of pizza “Joint” pizza, since you mostly get it in places that would be called “joints” and not “restaurants”, “dining rooms”, or anything else fancy. You walk in and buy your slices from the counter, usually with a quick re-heat in the oven, you slap on a quick sprinkle of dusty low-grade parm and/or red pepper flakes, and you’re ready to go. Nothing fancy, but this is what the quintessential pizza is: a fast food. I could probably exhaust years writing about nothing but the different places in New York (hundreds!) that serve a basic variation of the New York Slice (go look over at Slice’s blog, they’ve been writing up New York pizza places for years, and still have a long way to go), but a quick check of several print and online media sources all list one place as rising above others for the basic slice: Joe’s Pizza on 6th and Bleecker. 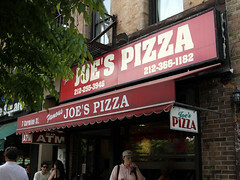 A modest storefront (shown here), Joe’s is your basic pizza joint: slightly dark, with a serving counter where you can point at the slices you want, which are then (if not just out of the oven) reheated and served to you on a paper plate. 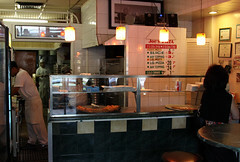 And that’s what I got, your basic regular slice (plain mozzarella), which I ate standing at a rickety table out front. The slice was a perfect example of the style: crust was perfectly thin and crisp. Sauce was nicely seasoned and not overpowering either the cheese or the crust. And the cheese itself was nicely toasted and warm, and just greasy enough to really taste like a good slice of pizza without being a complete gut bomb. It this the best pizza ever? Not even close. Was it good? 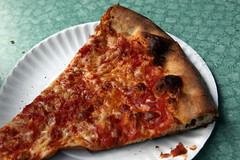 Yes, very good, and a great example of the classic New York slice.